We offer tweaks for five of the Buckeye State’s most popular Turkey Day dishes. If there’s one dish you’ll find on almost every Ohioan table come Thanksgiving, it’s green bean casserole. Try making the classic dish with this low-sodium recipe! 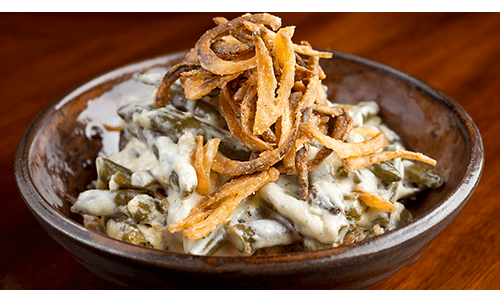 In a 9-by-13-inch casserole dish, combine green beans, soup, sour cream and pepper. Stir until well mixed and bake for 20 minutes. Remove casserole from oven, add half the onions and stir well. Top with remaining half and return to oven; bake 5 minutes more. Serves: 8. Calories: 77. Fat: 2 grams. Saturated fat: .5 grams. Protein: 3 grams. Carbohydrates: 12 grams. Fiber: 2 grams. Cholesterol: 4 milligrams. Sodium: 138 milligrams. Sugars: 3.2 grams. 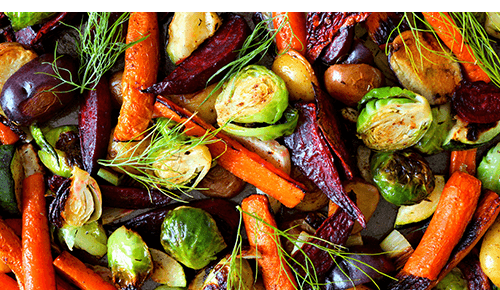 Grab your favorite vegetables and roast them with your favorite herbs and balsamic to bring out delicious, nutty flavors. Spray 9-by-13-inch baking dish with cooking spray. Thoroughly wash all vegetables, cut and toss together in large bowl. In small bowl, whisk together vinegar, oil, no-calorie sweetener, rosemary, garlic, onion powder, pepper and salt. Pour over vegetable mixture and toss well. Pour vegetable mixture into prepared baking dish. Bake in preheated oven for 30-35 minutes, stirring once, until all vegetables pierce easily with a fork. Serves: 8. Calories: 98. Fat: 2.1 grams. Saturated fat: .3 gram. Protein: 3 grams. Carbohydrates: 19 grams. Fiber: 5 grams. Cholesterol: 0 milligrams. Sodium: 170 milligrams. Sugars: 8 grams. 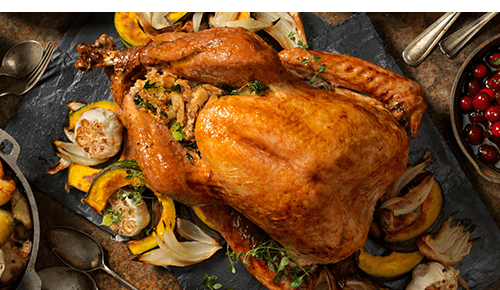 Save some rosemary from the roasted vegetable side dish and make this tasty turkey recipe. Remove giblets and neck from turkey; discard liver. Reserve neck and giblets. Pat dry. Trim excess fat. Starting at neck cavity, loosen skin from breast and drumsticks by inserting fingers, gently pushing between skin and meat. Lift wing tips up and over back; tuck under turkey. Combine butter, 2 teaspoons rosemary, 1 teaspoon salt, 1/4 teaspoon pepper, the coriander and the garlic in a small bowl. Rub butter mixture under loosened skin and over breasts and drumsticks. Tie legs together with kitchen string. Place remaining 1 teaspoon rosemary, reserved giblets and neck, carrots, celery and onion in the bottom of a large roasting pan coated with cooking spray. Add 1/2 cup broth. Place roasting rack in pan. Arrange turkey, breast side up, on roasting rack. Bake turkey at 425 F for 30 minutes. Reduce oven temperature to 325 F (do not remove turkey from oven). Add 1/2 cup broth to pan. Bake an additional 30 minutes. Rotate pan in oven; bake an additional 30 minutes or until a thermometer inserted into meaty part of thigh registers 165 F. Remove from oven; let stand on a cutting board for 30 minutes. Discard skin. Place a large zip-top plastic bag inside a 4-cup glass measure. Strain pan drippings into bag; let stand 10 minutes. Discard solids. Seal bag; snip off one bottom corner of bag. Drain pan drippings into a medium saucepan, stopping before fat layer reaches the opening. Add remaining 2 cups broth to pan; bring to a boil. Combine flour and water in a small bowl, stirring with a whisk until smooth. Stir the flour mixture into broth mixture, and boil 1 minute or until thickened, stirring constantly. Stir in remaining 1/4 teaspoon salt and remaining 1/4 teaspoon pepper. Serve gravy with turkey. Serves: 12 (about 6 ounces turkey and 1/4 cup gravy each). Calories: 304. Fat: 8.4 grams. Saturated fat: 3.9 gram. Protein: 51.3 grams. Carbohydrates: 2.6 grams. Fiber: .5 grams. Cholesterol: 177 milligrams. Sodium: 486 milligrams. Skip the sugar overload of your classic pie fillings. 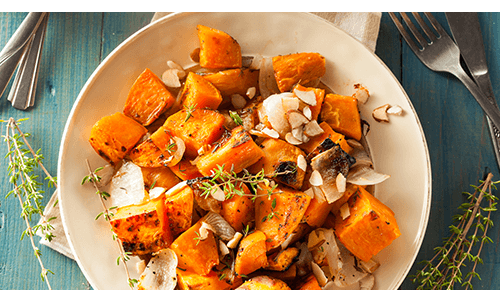 With this dish, you’ll get the sweetness of a dessert, but with the benefit of apples and sweet potatoes! Preheat the oven to 350 F. Lightly spray a 1 1/2-quart glass casserole dish with cooking spray. In the casserole dish, layer in order half each of the sweet potatoes, apples and cinnamon-sugar. Dot with about half the margarine. Repeat. Serves: 8. Calories: 101. Fat: 2 grams. Saturated fat: 0 gram. Protein: 1 gram. Carbohydrates: 21 grams. Fiber: 3 grams. Cholesterol: 0 milligrams. Sodium: 61 milligrams. Sugars: 14 grams. 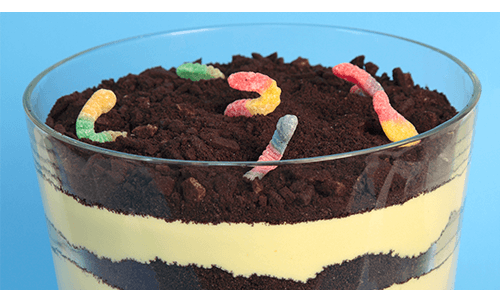 OK, so a good dirt pudding is never going to be the healthiest option. But we know how popular the dish is in Ohio so we found a recipe that cuts the levels of sugar and fat. Enjoy! In a large bowl, beat cream cheeses and confectioners’ sugar until smooth. In a large bowl, whisk milk and pudding mixes for 2 minutes; let stand for 2 minutes or until soft-set. Gradually stir into cream cheese mixture. Fold in whipped topping. Spread 1 1/3 cups of crushed cookies into an ungreased 9-by-13-inch dish. Layer with half of the pudding mixture and half of the remaining cookies. Repeat layers. Refrigerate for at least 1 hour before serving. Serves: 20 (1/2 cup each). Calories: 199. Fat: 6 grams. Saturated fat: 4 grams. Protein: 5 grams. Carbohydrates: 33 grams. Fiber: 1 gram. Cholesterol: 6 milligrams. Sodium: 348 milligrams. Sugars: 18 grams.